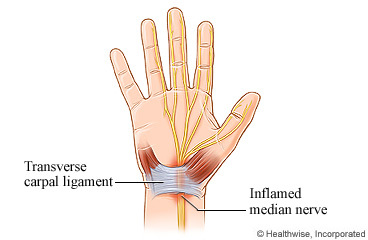 Carpal tunnel release is surgery that reduces the pressure on a nerve in the wrist. Your doctor will cut a ligament that presses on the nerve. This lets the nerve pass freely through the tunnel without being squeezed. The surgery can be open or endoscopic. In open surgery, your doctor makes a small cut in the palm of your hand. This cut is called an incision. In endoscopic surgery, your doctor makes one small incision in the wrist, or one small incision in the wrist and one in the palm. Your doctor puts a thin tube with a camera attached (endoscope) into the incision. Surgical tools are put in along with the endoscope. In both types of surgeries, the incisions are closed with stitches. The incisions leave scars that usually fade in time. You may be asleep during the surgery. Or you may be awake and have medicine to numb your hand and arm so you will not feel pain. After surgery, your wrist and hand pain should begin to go away. It usually takes 3 to 4 months to recover and 1 year before your hand strength returns. How much hand strength returns is different for each person. You will go home the same day as the surgery. When you can return to work depends on the type of work you do. The surgery will take about 15 to 60 minutes. Enter X027 in the search box to learn more about "Carpal Tunnel Release: Before Your Surgery".